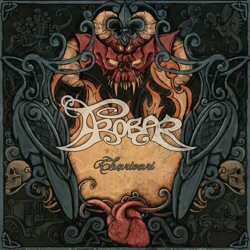 Folk progressive metal band Trobar from Québec has recently released its debut full-length album “Charivari”. Founded back in 2009 in Rimouski, Trobar released the promising 5-track EP “Vÿs” in 2011, developing a quite personal style. Now, 3 years later, they return with the exact same line-up and much more experience to present us a more complete work. Like the EP, “Charivari” is also self-released and it was out on the 15th of April 2014. The band continues in the style they introduced in the EP, offering a very personal mixture of folk, progressive and extreme metal. Their music still remains experimental, combining various music styles, but this time the result seems much more solid and tight. “Charivari” includes 12 songs with a total duration a little over 70 minutes! Most of the songs are new compositions, there are also some tracks composed before the release of the debut EP, but they were never recorded. Trobar have a distinctive and somehow “dry” sound in their orchestrations, not in a negative way though, since their music has something very natural, unpolished and honest. The band does a great work in the guitars: rhythmic riffs and melodic leads, with a clearly progressive mood, enriched by beautiful acoustic guitars, great solos and many folk guitar tunes. Traditional acoustic instruments, mostly flutes, accordion and piano, are combined skillfully in so many different ways and styles (both folk and prog oriented), while the discreet synths appear only when needed, either helping with more folk instrumentation, or enriching the overall atmosphere, or even adding a few hints of electronic elements. Drums and bass are also quite active, natural and technical, helping the band to create a very clear sound. Trobar have done a wonderful work in the vocals too. Expressive death black metal growls is the majority of them, but they also have beautiful choirs and many wonderful clean male and female vocals. This mixture of extreme and melodic progressive metal with folk music of Celtic or traditional Quebecois origin, results in a unique, bizarre and very interesting atmosphere. Despite the long duration of the album, the band avoids repetition with its innovative compositions and the ever changing rhythms and moods of the songs. Aggressive parts, melancholic mood, epic elements, acoustic melodic passages, happier festive parts and beautiful instrumental interludes compose this unusual album. All their lyrics are in French Canadian and you can find them in the CD booklet. “Charivari” is a very good album, a really original work of folk progressive metal with extreme elements, mostly in the vocals though. Trobar have a great balance between melody, technical skills and aggression, under a professional production and a very interesting personal sound. The band is more than willing to experiment and the best proof for this is the amazing 12-minute closing track “Pactés À Mort“. The album is self-released in a standard jewel-case CD with 12-page booklet illustrated by Alexandre Levasseur. The album is also released digitally in their official Bandcamp page, so you can listen to their music, following the links below.